I am utterly shocked at how little I have read this year. For someone who usually reads three books a week, I’ve plummeted to a mere 11... for the entire year. I actually feel a bit sick. I’m a disgrace. 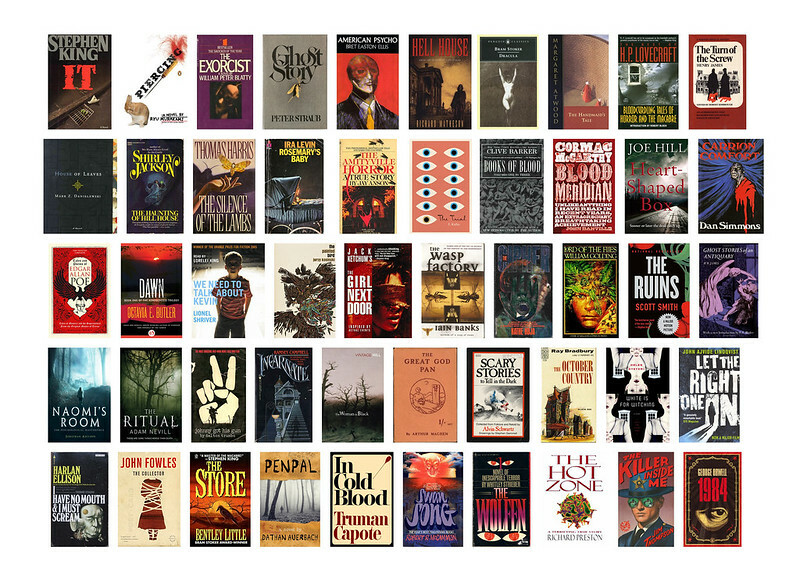 I discovered Flavorwire’s list of the fifty scariest books and since I’m an absolute fool for lists (particularly literature and cinema related), and because I traditionally devote the entire month of October to books that keep you awake at night; this list has reignited my passion for reading. I’ve listed each of the fifty books Flavorwire thinks you should read, striking out the ones I’ve already read, and highlighting the ones I really want to read as soon as possible. I’ve already picked up a copy of Clive Barker’s Book of Blood and read through Dathan Auerbach’s Penpal and Harlan Ellison’s I Have No Mouth, and I Must Scream. Why have I read none of these?! Once ive finished 1Q84 il start on these. I love reading and its so much easier now that ive stolen by bfs kindle ;). YES I have a Kobo and I switch between reading physical books and digital copies. I love them both. If you need are recommendations on where to start, let me know! Some of my favourites made it onto this list. I've read a couple on here, the most recent being 'We Need To Talk About Kevin', a truly odd book which led me to dislike both Kevin and his mother. YES that book made me feel all kinds of weird. I didn't like the mother at all.. but the son, he was.. UGH. Just an awful person. I agree. I want this blog to be all aspects of my life, not just the beauty stuff. I am glad people liked this post. I just stumbled across your blog via Twitter and as a massive horror fan I feel compelled to comment on this post. I've read a lot of these but there are a few intriguing ones that I've missed. They're going straight on my reading list! I highly recommend Piercing by Ryu Murakami (and his Audition and In the Miso Soup) and Rosemary’s Baby by Ira Levin which is pretty much my all-time favourite book. The Haunting of Hill House by Shirley Jackson is amazing and so is anything by M.R. James.